Calcaneal fractures may be difficult to reduce and there are many possible complications of the standard open reduction and internal fixation. 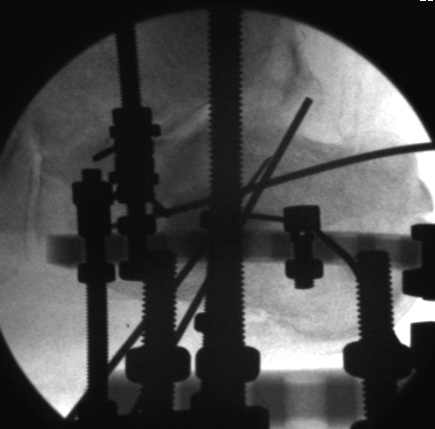 This case study illustrates use of the Ilizarov method combined with a balloon kyphoplasty technique as an additional approach to reduce these complex fractures with a minimal incision. 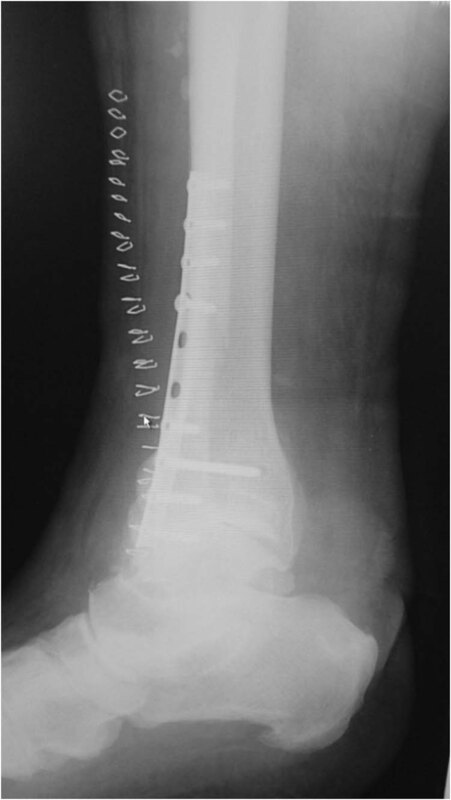 This innovative technique not only minimize risk of infection, but also offers an alternative approach to patients who would otherwise be poor candidates for the standard calcaneal fracture requiring an open reduction internal fixation. The calcaneus is the most common fracture of the tarsal bones, usually sustained by high-energy trauma such as a motor vehicle accident or a fall from a great height [4,7]. Calcaneal fractures account for approximately 60% of all foot fractures, with 70-75% of calcaneal fractures being intra-articular . The decision regarding operative versus non-operative treatment of calcaneal fractures is reported to be controversial in literature with consideration given to the severity of fracture and whether or not the patient is an appropriate surgical candidate . 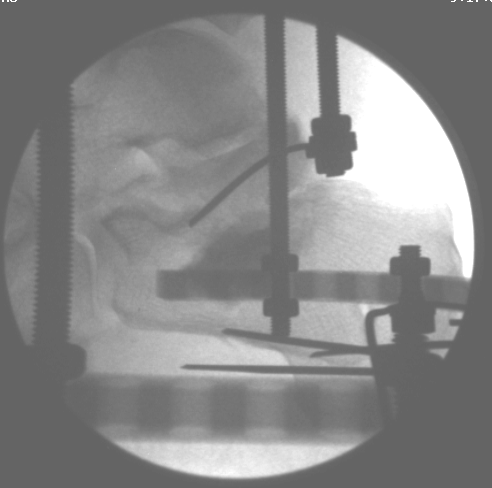 A 2013 study indicated that while operative treatment was unsuccessful at managing displaced intra-articular calcaneal fractures at the one year follow up, at the eight to twelve year follow up, operative treatment was shown to be beneficial with decreased prevalence in posttraumatic arthritis . Non-operative treatment is usually indicated in patients with non-displaced fractures and patients who are poor surgical candidates . This treatment method generally involves below the knee casting with early range of motion exercises or closed reduction with percutaneous pinning and casting . 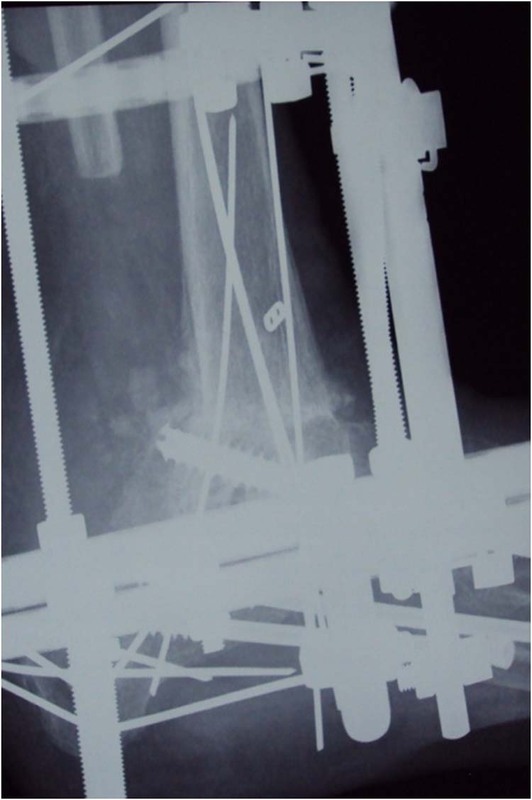 The open reduction internal fixation approach to calcaneal fractures involves a large lateral L type incision allowing for exposure and maneuverability to reduce and fixate the fracture. Careful dissection is needed avoiding the peroneal tendons and sural nerve . The lateral wall is dissected, mobilized, and the remaining fracture patterns are reduced to as close to anatomic position as possible, with care noted especially to the articular surfaces . 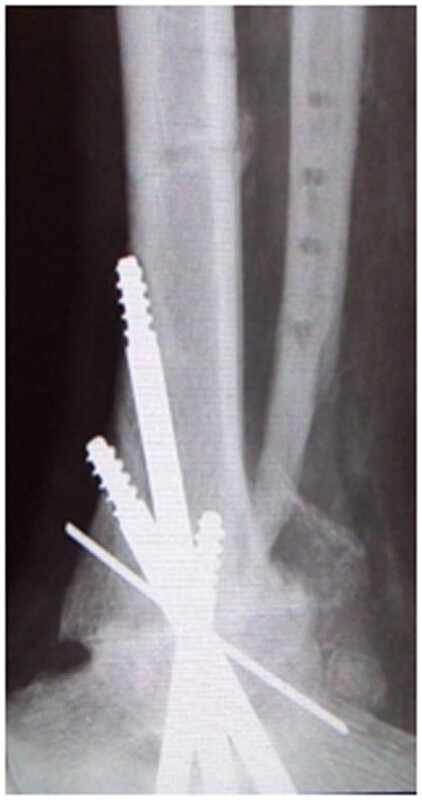 The fracture is typically fixated using screws and a low profile lateral neutralization plate . 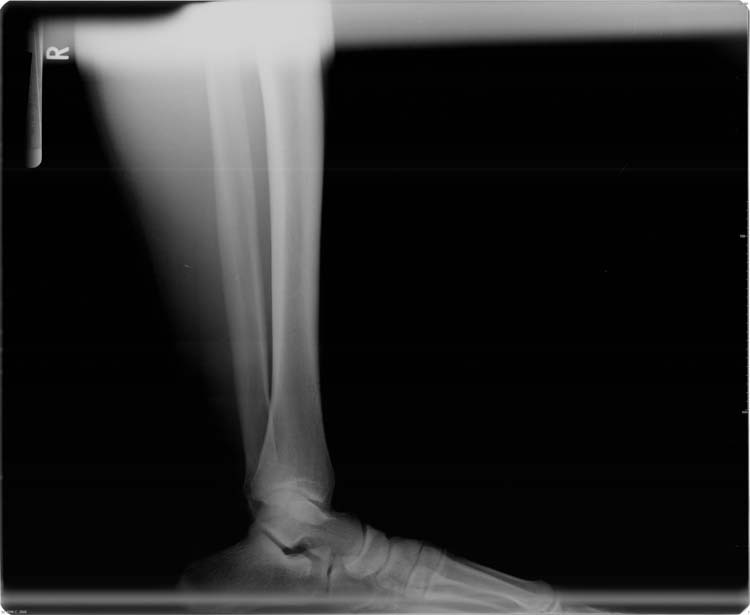 Though this technique is currently the standard for displaced intra-articular calcaneal fractures, it is not without its inherent risks. 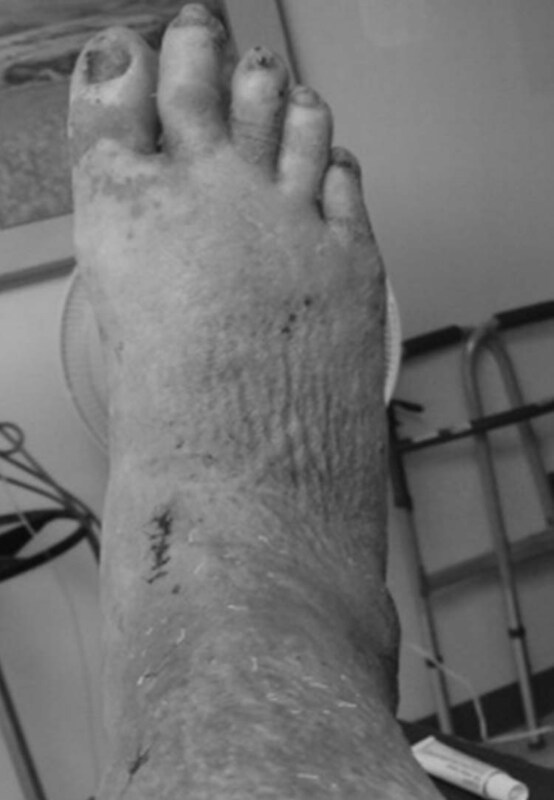 Because of the large extensile incision needed with the use of plates and screws, there is risk of infection, wound dehiscence, and osteomyelitis. 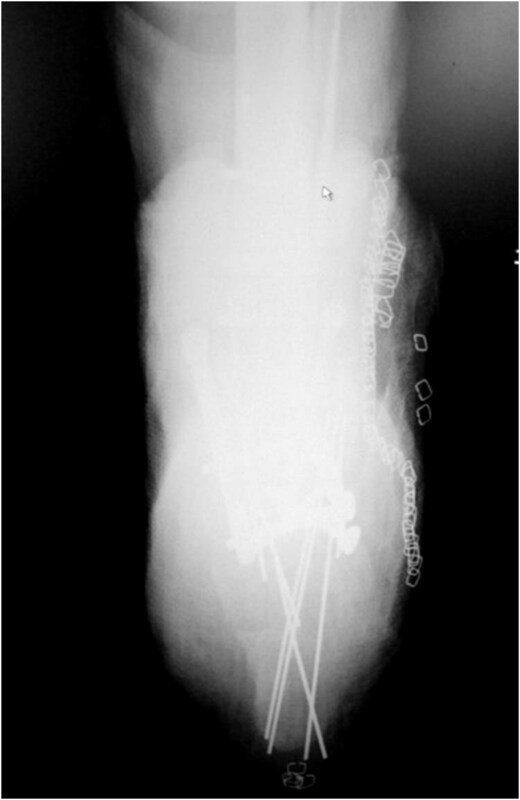 A 2001 study of 183 patients with calcaneal fractures treated by open reduction internal fixation resulted in 7 patients with infections (3.2%), 1 of which went on to osteomyelitis of the calcaneus and eventually a below the knee amputation . 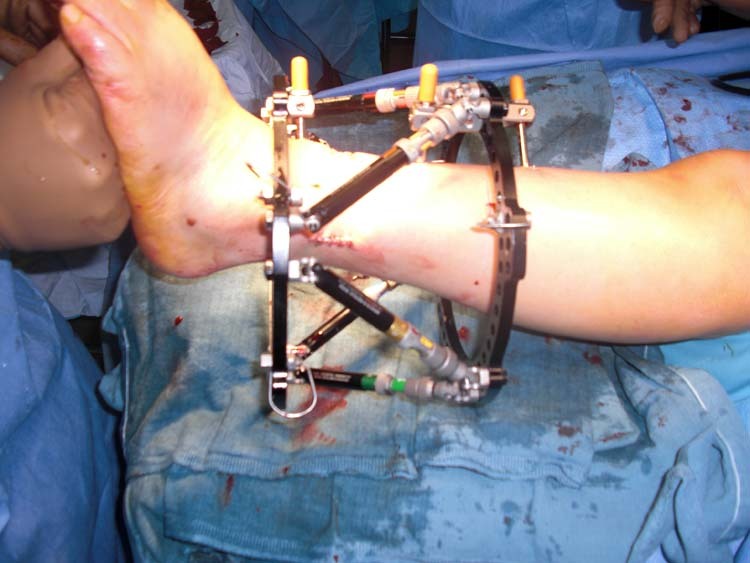 An additional method described is use of external ring fixation for calcaneal fractures . A 2004 study of 23 patients described a methodology allowing for that patients to weight bear the first postoperative day with few complications noted other than superficial skin infections and no deep infections . 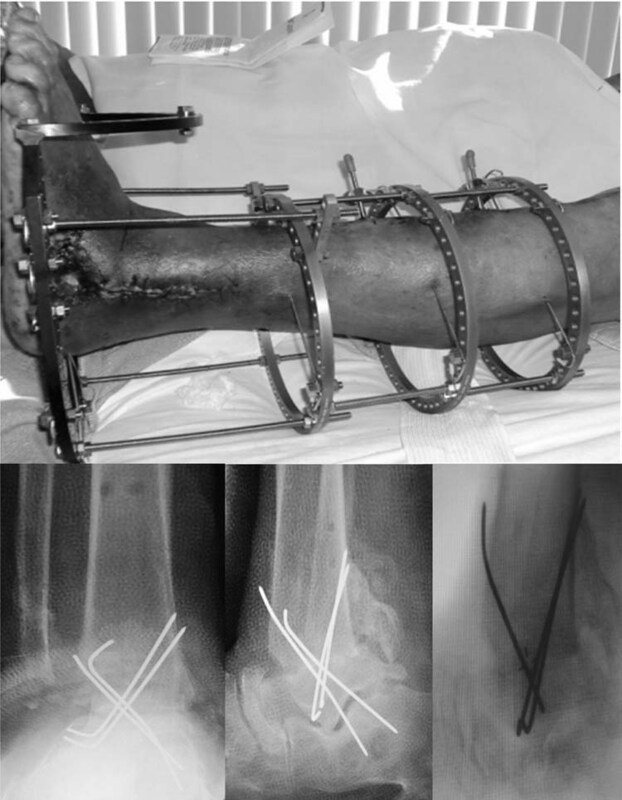 The aim of this paper is to present a case presentation detailing the use of an Ilizarov external fixator in conjunction with a balloon kyphoplasty technique in the reduction of an intra-articular calcaneal fracture as an alternative means of approach that uses a minimal incision to reduce fracture fragment and maintain heel height. The patient was placed in a supine position and prepped with Betadine. 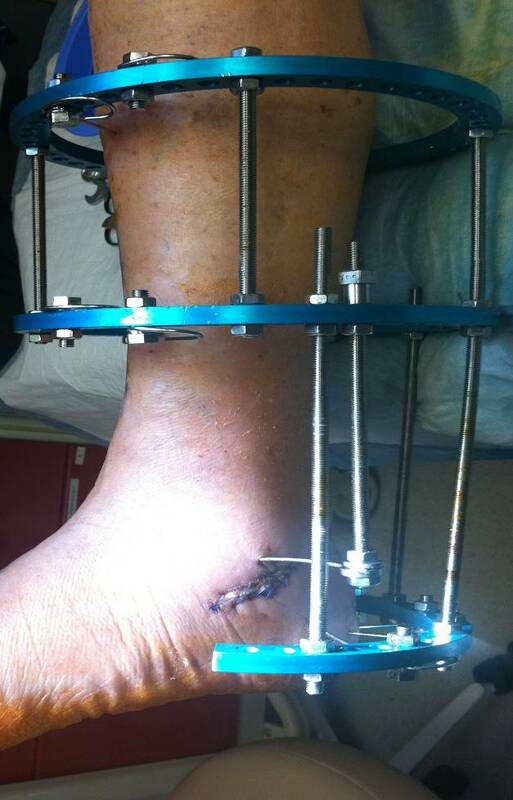 Two tibial rings were placed on the tibia and then tensioned appropriately. 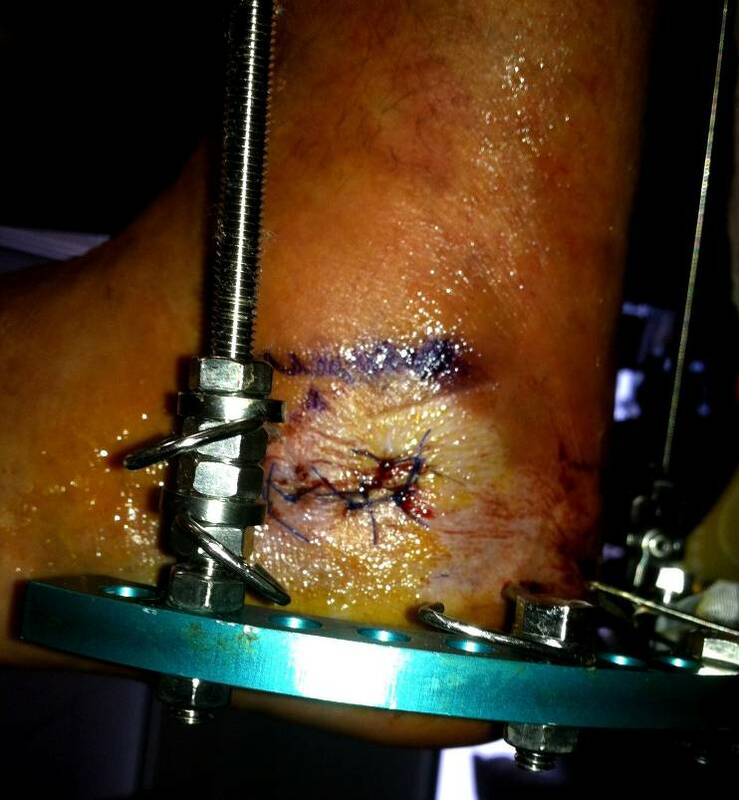 A 5/8 ring was then applied to the calcaneus with one or two tensioned wires. 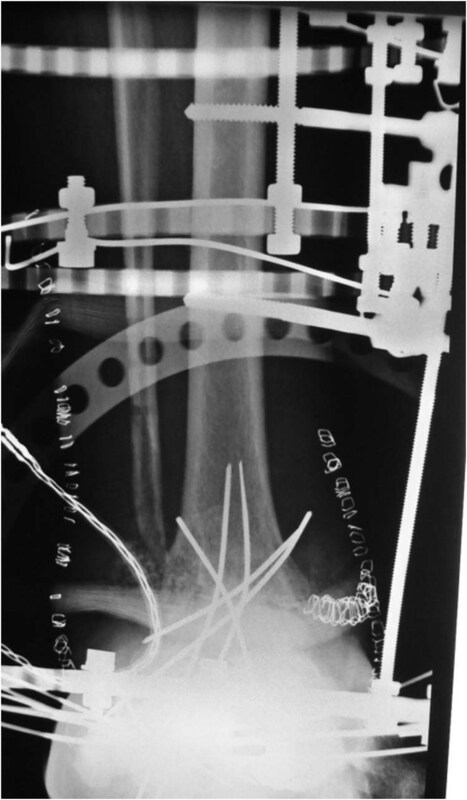 Several other thin wires were placed as half pins (the wire has one entry point and no exit point) to help prevent medial or lateral translation and remained for the duration of the frame. The 5/8 ring was placed in slight equines. 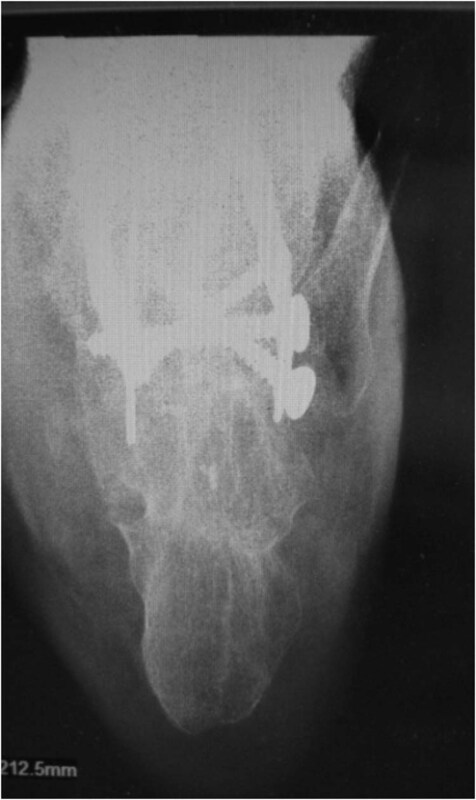 Two rods were then placed from the tibial block ring to the 5/8 ring to distract the subtalar joint and ankle joint. The 5/8 ring was also used to manipulate the calcaneus out of varus and to translate it medially. 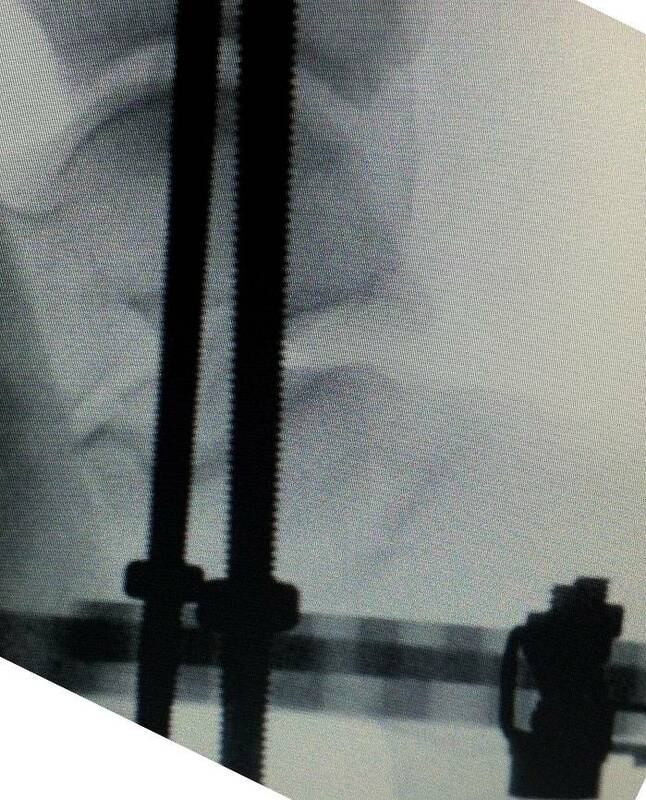 After the distraction, the rods were tightened. Fluoroscopy was used to identify the subtalar joint and identify the fracture site. A 2 cm incision was made on the lateral foot at the area of the subtalar joint. 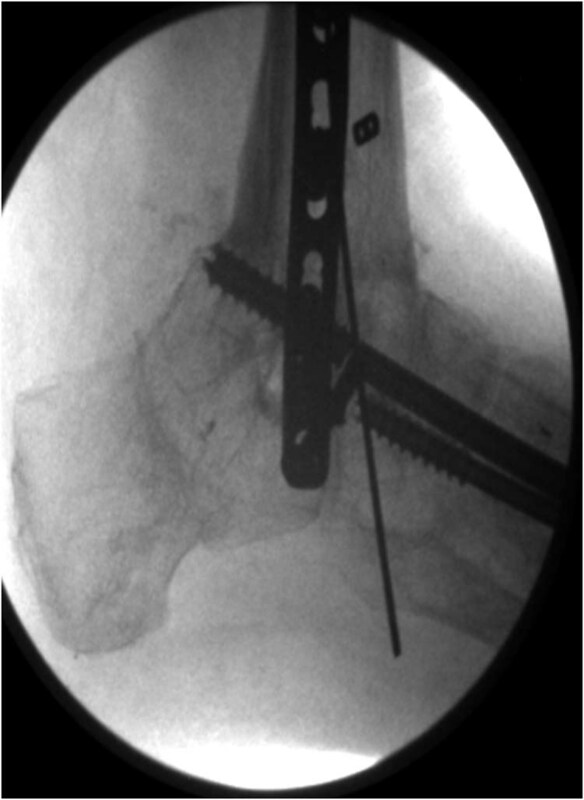 A small periosteal elevator was placed under the depressed fracture fragment and through the lateral wall. Note that the lateral wall was not removed or dissected out. 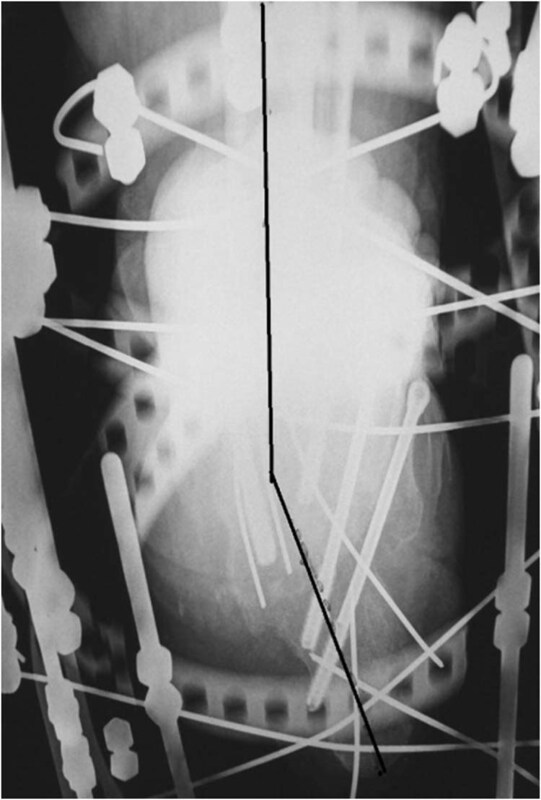 Then a size 15 balloon with a 4 cc filling capacity from the kyphoplasty device (Figure 17) was placed through the lateral wall and above the periosteal elevator from lateral to medial. 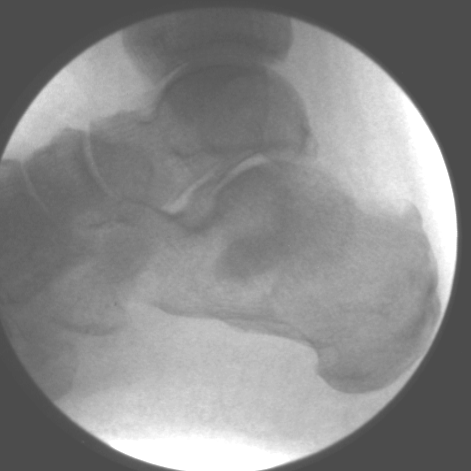 A calcaneal axial image was taken using fluoroscopy, which confirmed the balloon was in the center of the calcaneus. The balloon was then inflated. The elevator was inferior to the balloon so that as it was inflated, the fractured fragment would only go superior without any expansion inferiorly. After the fragment was elevated, the subtalar joint was re-evaluated. After noting good anatomic position, several wires were inserted to hold the fragment in position. Care must be taken while inserting wires to prevent puncturing of the inflated balloon. The balloon was then removed. The lateral blowout wall was then manually compressed and held with wires. The large void that occurred was filled with calcium sulfate xenograft (PRO-DENSE, Wright Medical Technology, Memphis, TN). The incision was then closed with 3-0 prolene. No deep sutures were used. Immediate weight bearing was allowed as tolerated. The patient is a 71 year-old male with a history of chronic smoking who was on a ladder and fell. He had an intra-articular calcaneal fracture. There was a joint depression fracture with a decreased Bohler’s angle. Figures 1-9 show the progression of the surgery, realignment and healing of the fracture. 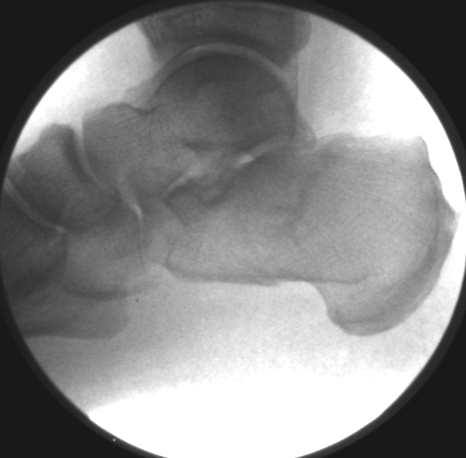 Figure 1 Preoperative image showing joint depression-type calcaneus fracture with a decrease in Bohler’s angle. 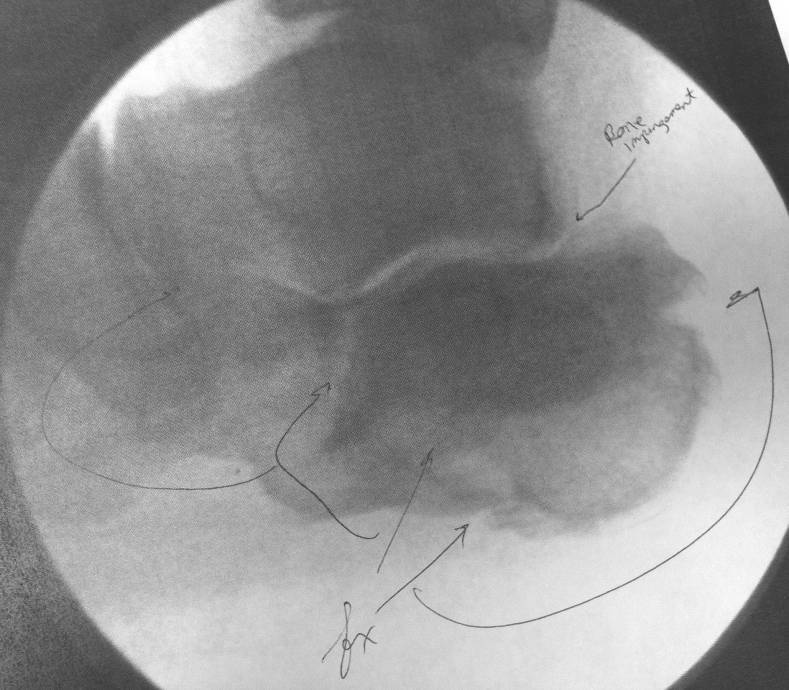 Figure 2 Intraoperative image of calcaneal fracture with the subtalar joint and ankle joint distracted. The posterior facet is still depressed. 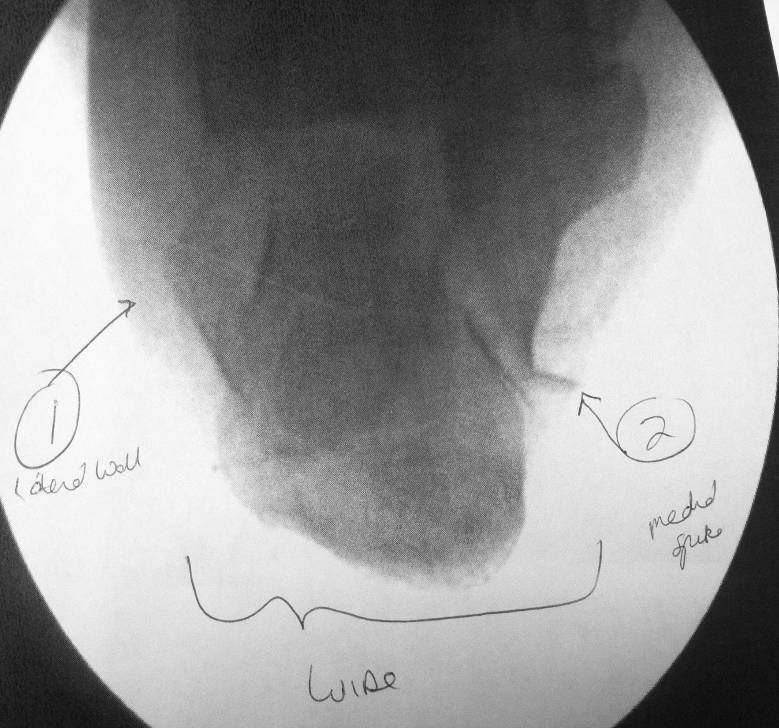 Figure 4 Intraoperative image of calcaneal fracture reduction showing the balloon from calcaneal axial view. 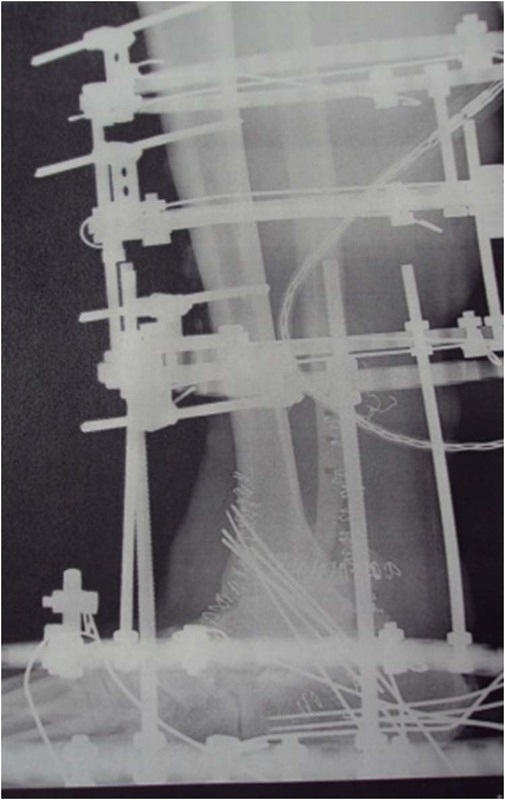 Figure 5 Intraoperative image of calcaneal fracture with elevated posterior fragment held in place with pro-dense and wire attached to the frame immediately after surgery. 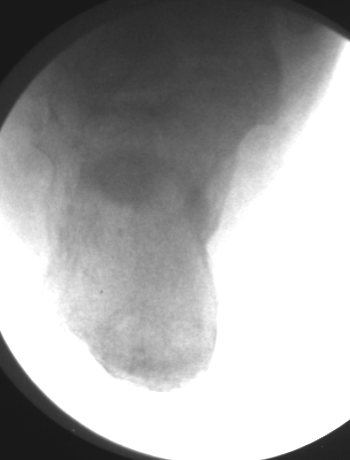 Note the fracture line above the PRO-DENSE (Wright Medical Technology, TN). 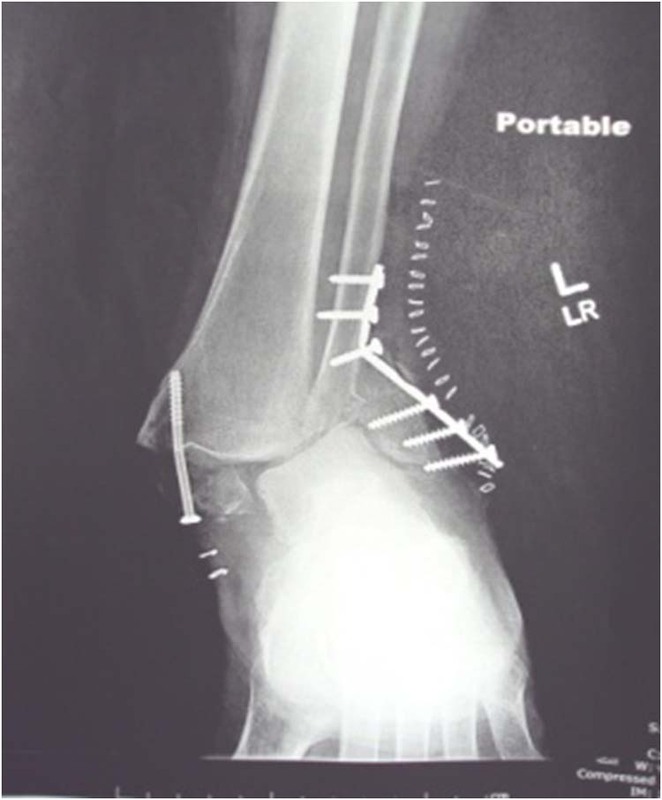 Figure 6 Postoperative image of calcaneal fracture with elevated posterior fragment held in place with PRO-DENSE (Wright Medical Technology, TN) and wire attached to the frame. Six weeks status post surgery. 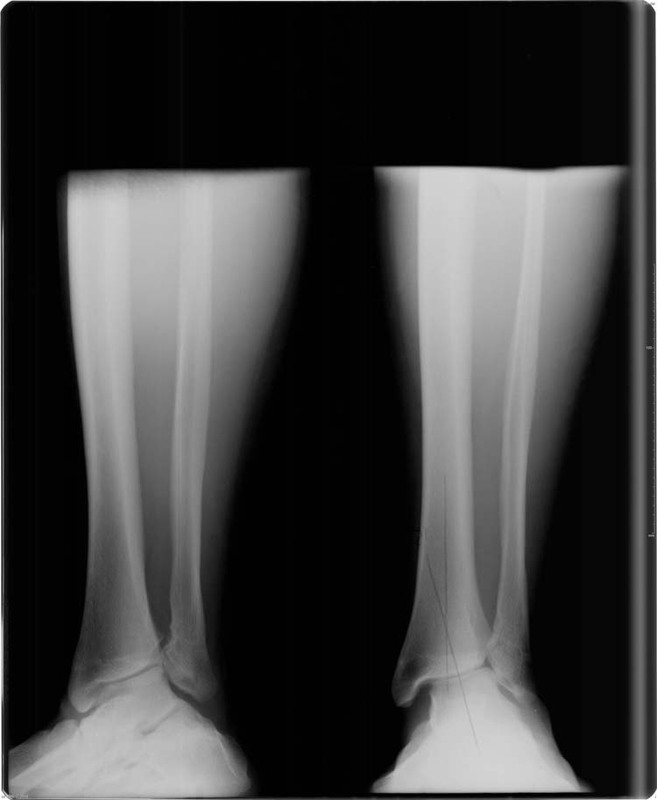 Note the fracture line has healed. 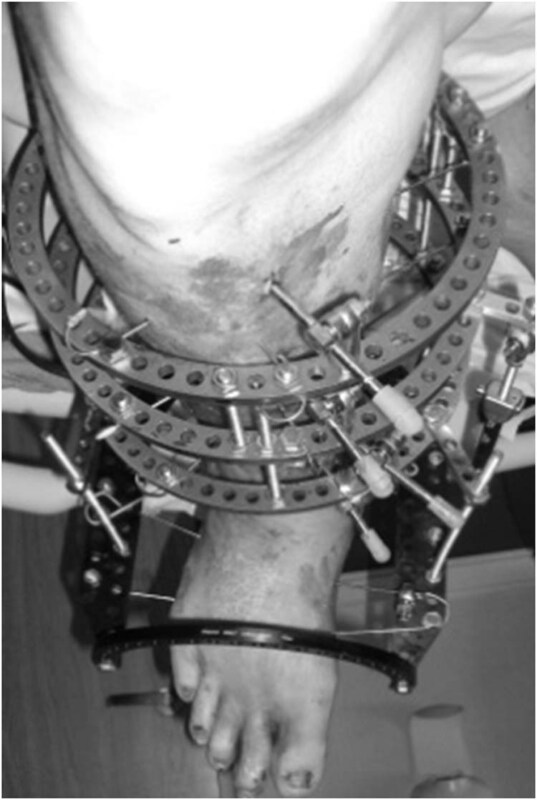 Figure 7 Postoperative image of patient with the frame on. Note the small incision on the lateral foot. 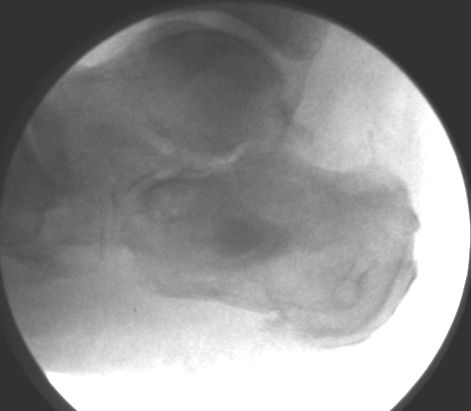 Figure 8 Final postoperative calcaneal axial image after external fixator has been removed. 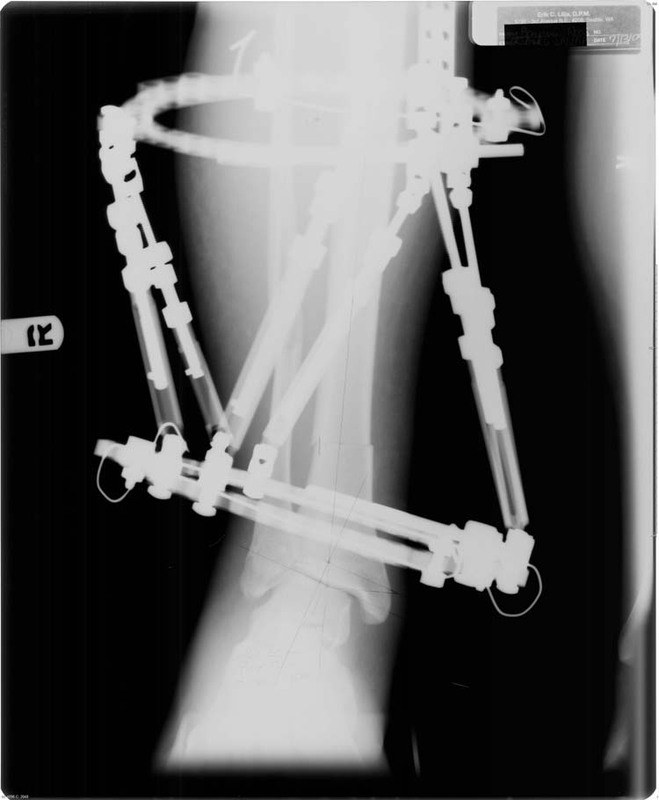 Figure 9 Final posteroperative lateral image after external fixator has been removed. The patient is a 64 year-old male who also fell from a ladder. He had an intra-articular calcaneal fracture. 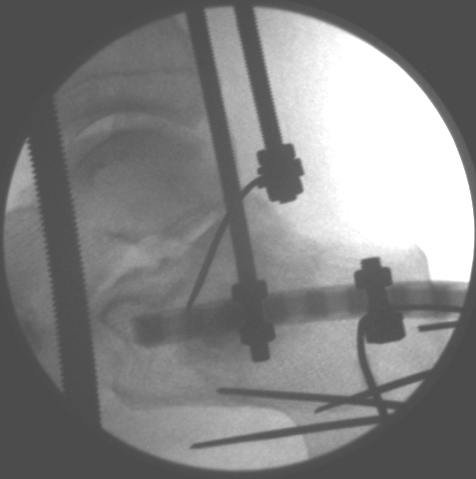 There was a joint depression fracture with a negative Bohler’s angle and a lateral wall blowout. Figures 10-16 show the progression of the surgery, realignment and healing of the fracture. 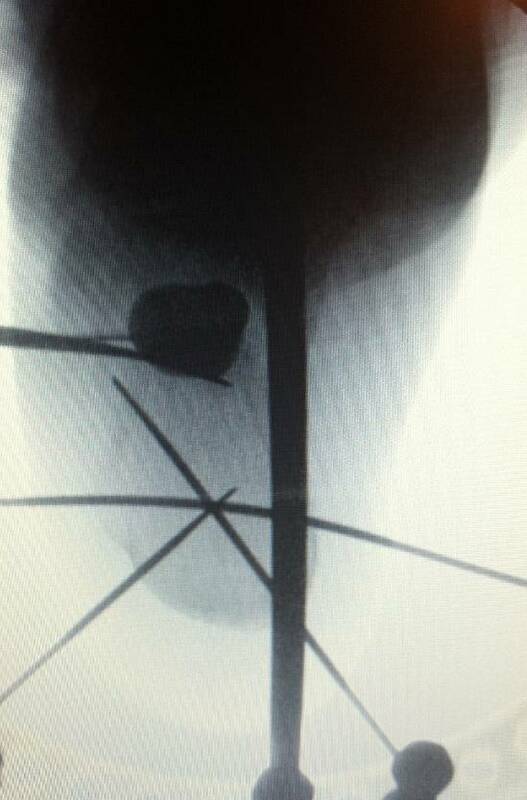 Figure 11 Preoperative lateral image. Note the calcaneal bone impingement on the posterior talus. Figure 12 Intraoperative image showing the incision site. 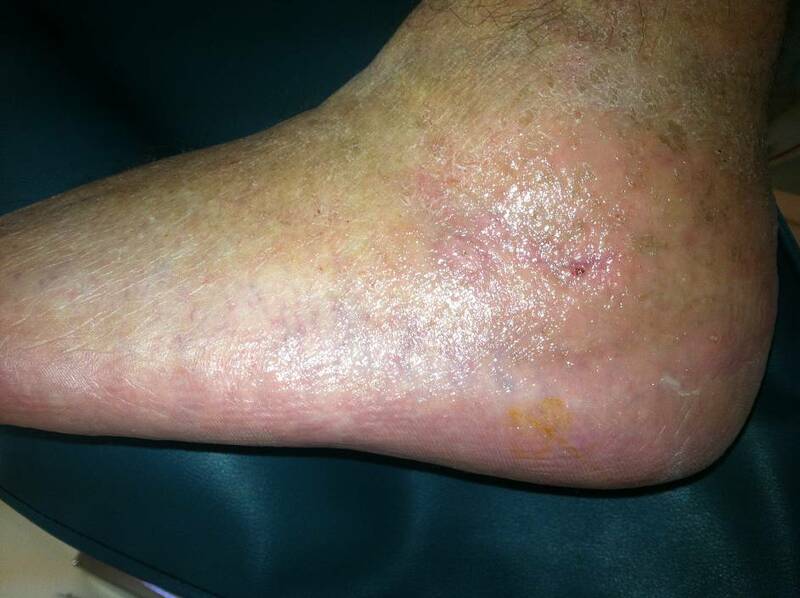 Figure 13 Postoperative lateral image several weeks after application of the external fixator with balloon kyphoplasty. Figure 14 Postoperative image three months after surgery with good restoration of heel height. There is some arthrosis but minimal to no pain. 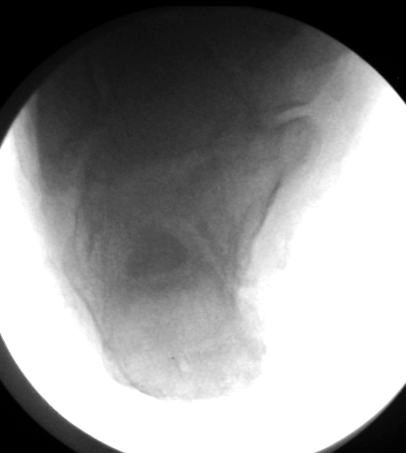 Figure 15 Postoperative calcaneal axial image showing good alignment. 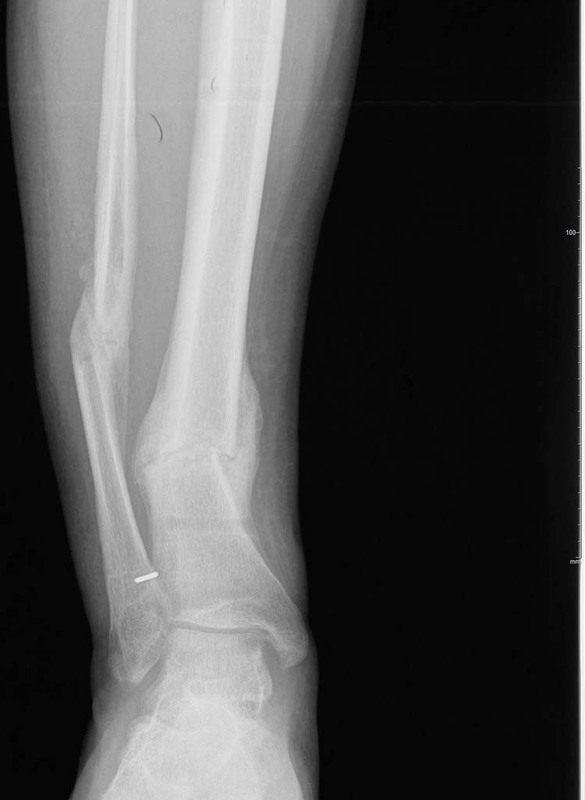 Figure 16 Postoperative image. Healed minimal incision in at 3 months. Figure 17 Kyphoplasty instruments. A: Pump connected to catheter. B: Deflated balloon. C: Balloon inflated with dye. 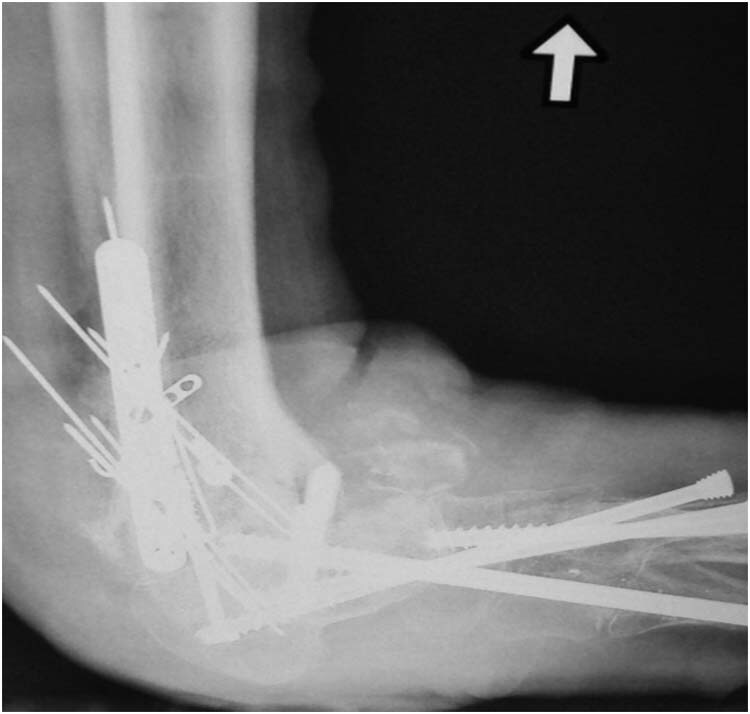 This paper demonstrates a novel approach in the reduction of calcaneal fractures with a minimally invasive technique using balloon kyphoplasty, calcium phosphate bone cement and Ilizarov method. Balloon kyphoplasty was originally used for vertebral body fractures and has been used in over 600,000 cases . 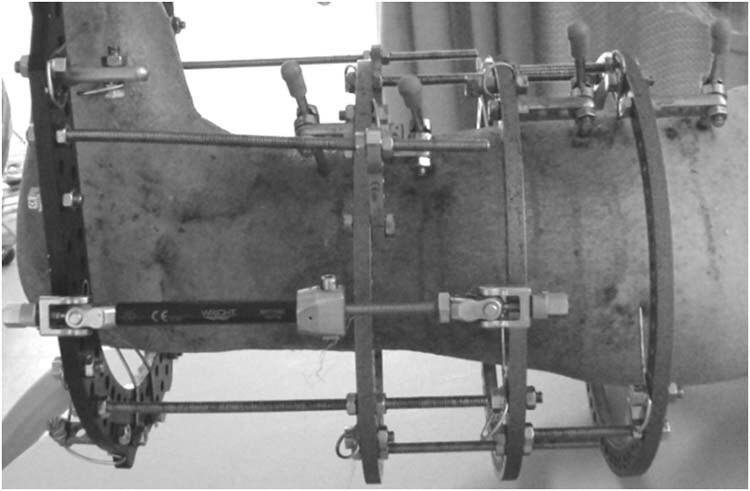 In this paper, the same technique was applied for the reduction of the calcaneal fractures. 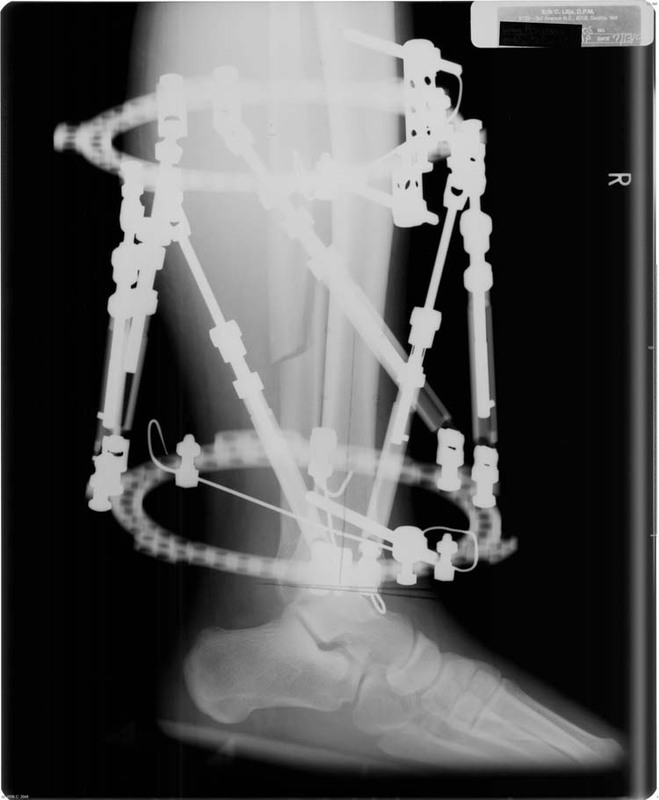 Acting as a reduction tool, a size 15 balloon was percutaneously inserted into the calcaneal body under the fluoroscopic control and then inflated to reduce the fracture and impact cancellous bone. Bone cement is inserted into the bone void in order to support the fracture reduction and maintain the vertebral body height . The large void that occurred after the balloon was removed was filled with calcium sulfate xenograft (PRO-DENSE, Wright Medical Technology, Memphis, TN). The calcium sulfate of the implant resorbs first, revealing a porous calcium phosphate scaffold conducive to vascular infiltration. Calcium phosphate bone cement was used because it has isothermic properties allowing for quick set up in a wet environment, osteoconductive properties allowing for new bone development while simultaneously becoming resorbed, and is readily available. Moreover, it permits for the avoidance of autogenous bone graft and its associated complications, such as having an additional surgical site and possibility of infection . PMMA, DBM or any bone void filler would also be sufficient as well. This technique allows for a minimal incision through any angle . 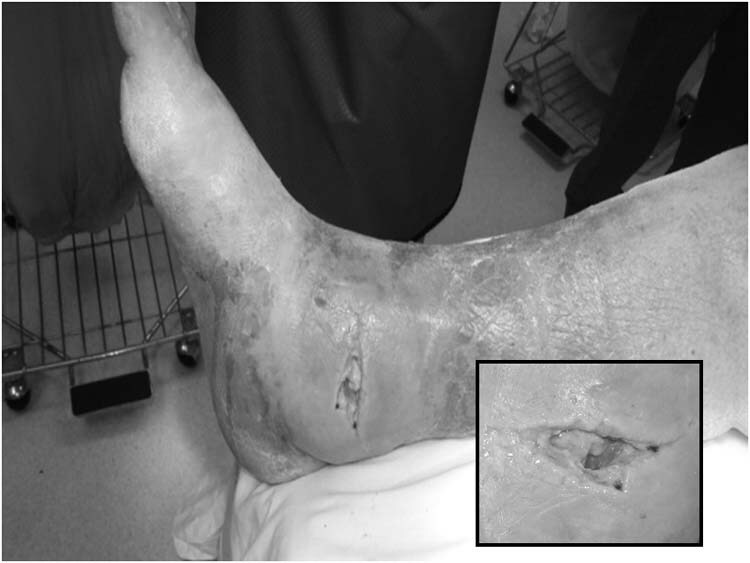 This approach may be beneficial in providing a novel technique in calcaneal fractures in situations where a large skin incision may not be a viable option, such as when there is little skin of feasible quality . 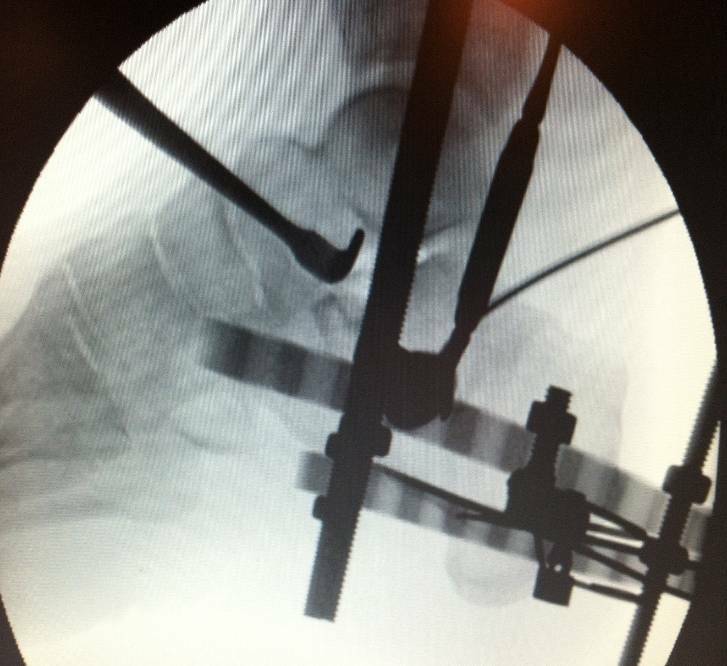 Furthermore, a 2011 case series study using balloon reduction reported an excellent outcome at three year follow up, suggesting that percutaneous balloon reduction and cement fixation of calcaneal fractures may be a promising technique . 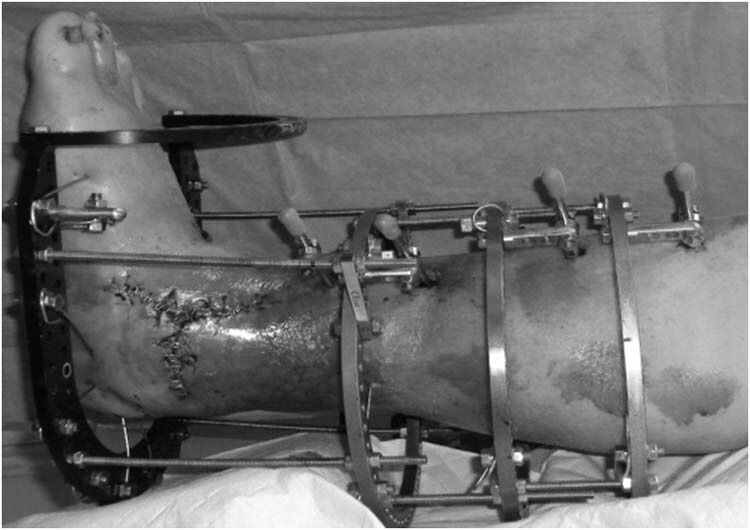 The Ilizarov apparatus was used in order to maintain the desired reduction with minimal complications. During the application, any varus or valgus deformity is corrected, congruency of articular surfaces is upheld, and restoration of calcaneal height and width with improved Böhler and Gissane’s angles are sustained . 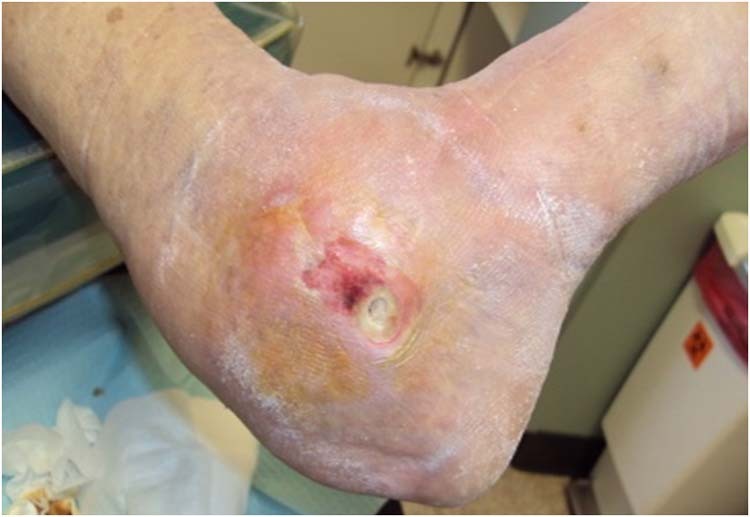 The most common complication with the Ilizarov apparatus is superficial skin infection at wire insertion sites, therefore care is necessary to prevent pintract [pin tract] infections . A 2004 study compared fixation of calcaneal fractures utilizing external fixation versus internal fixation . 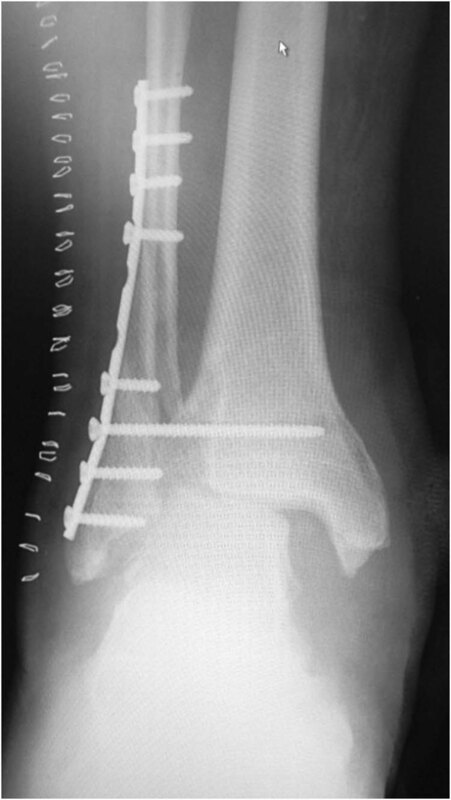 Both groups had similar functional and radiographic outcomes, however the internal fixation group had a higher complication rate due to wound complications relating to the lateral extensile incision . A 2005 restrospective study in Finland had wound complications in 35 cases (24%), 20 of which needed additional operative treatment (10). Again, another 2009 study cited a 17% wound complication rate . 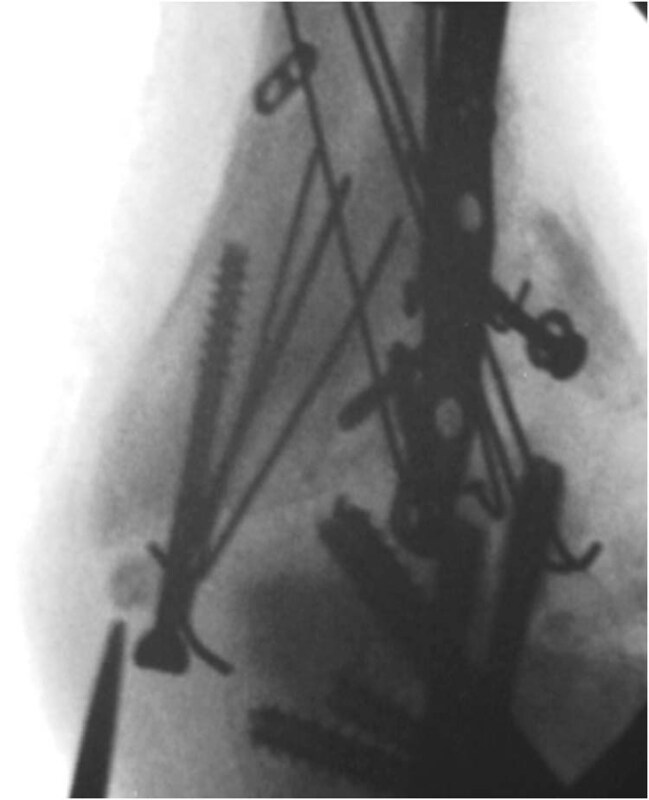 Moreover, with the Ilizarov technique there are no plates or screws left inside the foot once the Ilizarov device is removed. This reduces the risk of wound problems, deep infection, hardware penetration, or peroneal tendon irritation by hardware . The Ilizarov apparatus for reduction or calcaneal fractures is a safe and effective alternative, while providing comparable results to the traditional ORIF approach . 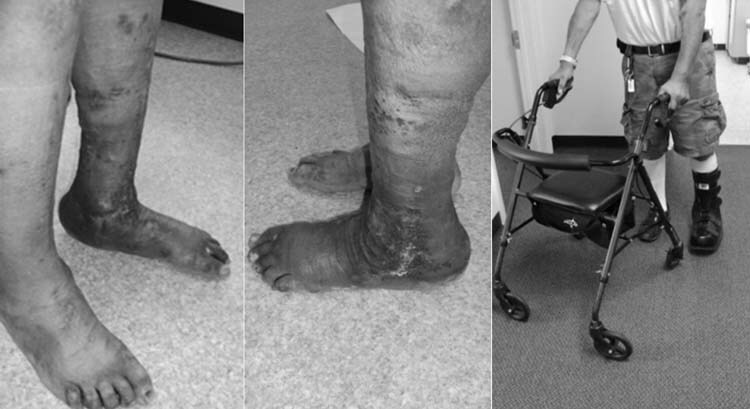 In patients with calcaneal fractures, reduction can be difficult, and surgical treatment often requires large incisions with many potential complications. 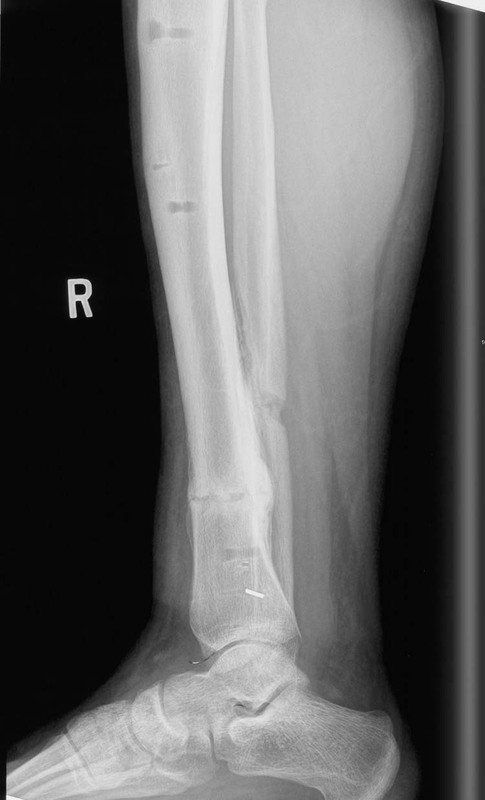 The procedure described here, combining the Ilizarov technique with the use of kyphoplasty, is a viable option for reduction and fixation of calcaneal fractures. It affords the use of a reduction using a minimal incision therefore decreasing all the risks of a large incision as in the classic open reduction internal fixation technique including infection and skin necrosis. It also offers an alternative technique to patients who are not a viable candidate for large incisions. Furthermore, there is little literature on this technique as a means for reducing displaced calcaneal fractures therefore presenting a novel approach in which more research needs to be performed. Sanders R.W. & Clare, M.P. (2007). Fractures of the Calcaneus (M. Coughlin, R. Mann, & C. Saltzman, Eds.). In Surgery of the Foot and Ankle Vol. II (pp. 2017-2073). Philadelphia, PA: Mosby Elsevier.